Thigh straps perform two crucial functions in whitewater paddling—they keep you secure in the boat and they’re essential for maximum boat control. These deluxe thigh straps are contoured, providing more surface contact for increased control, and padded for greater comfort. The 3" wide straps are made with EVA foam inserts that won’t rot, mildew, or absorb water. The exterior is soft, rugged Cordura nylon. The thigh straps feature a 1" Type V (Coast Guard-approved), quick-release, heavy-duty Fastex buckle and an extra long tail for adapting to the Three- Point, Double-Strap System. The Bungee System suspends the thigh straps from just below the gunnels, keeping the straps hooped and ready to slide into. Knee Straps provide maximum boat control by anchoring your knees to the hull. 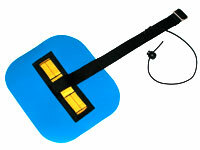 Flexible plastic inserts are used to retain the strap’s shape, preventing it from rolling or bunching up. A reverse stitch at the heavy duty metal slider prevents legchaffing. Knee Straps can be usedwith the Padded Contoured Thigh Strap or 1" webbing as part of the Three-Point, Double-Strap System. 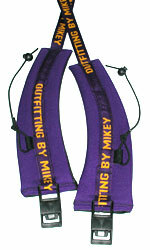 The Bungee System connects the Knee Strap to the Bag Cage, keeping the straps in a hooped position, ready to slide into.